« DID GOD INVENT EVIL? I am finding out, to my utter astonishment, that I’m good at board games. Well, not all board games; just one that has become quite popular in the last decade. 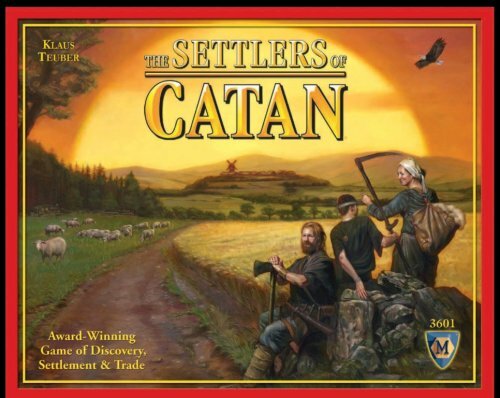 Settlers of Catan has been translated into 30 languages and was called the “board game of our time” by the Washington Post. My family plays at almost every gathering. Each participant is a colonist settling an island (Catan) and the idea is to reach 10 points first by building settlements, cities, and roads using cards representing the island’s natural resources. Along the way, you can trade cards with other players and buy cards that give you armies or the right to steal resource cards from other colonists. As you can tell, there are plenty of variables, but the game is a lot of fun once you understand everything. For awhile, that was the problem. I just couldn’t deal with all the dynamics, so a blind man could drive a car better than I could play Settlers of Catan. And it made me more depressed than a Toronto Maple Leafs fan. But somewhere along the way it all came together, and lately, I win games like retired hockey great Wayne Gretzky scored goals. Trouble is, as soon as someone reaches 10 points, the game is over. We put our roads, settlements, cities, and cards back in the box and in just a few minutes, my great accomplishment is forgotten. It occurs to me that life is pretty similar. Wayne Gretzky won a ridiculous number of awards, but now he’s retired and his talent remembered only by hockey fans. More often than not, Wayne walks the streets in anonymity, just like you and me. When I consider this, I’m reminded to ask the sort of questions that our culture discourages: Why am I here? To win board games? To consume, watch TV, sleep, have kids, go on vacations, and die? I really hope that explanation leaves you feeling emptier than a shopping mall on Christmas day. Perhaps you are here just to enjoy the ride and not think about it any further. Our culture encourages that answer, but would you be reading this essay if you were that superficial? Consider this from the biggest possible point of view: maybe you’re here because God created you. Maybe you were, as the Bible puts it, created in God’s image—meaning you are able to love, laugh, feel, and think. If you’re still with me, maybe you’re here so you can connect with God, find out about an amazing guy named Jesus, and be that guy’s ambassador to a world we both know isn’t doing well. Does that make sense?